Blog - How To Make Your Photos On Canvas Last Long? How To Make Your Photos On Canvas Last Long? Photos on canvas normally have longer life when compared to photos that are printed on photo paper. 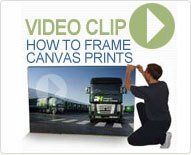 You will be able to enhance the life of photos on canvas further by following some of the basic tips and precautions. First make sure that you are buying good quality photos on canvas. This is the basis and if the photos on canvas that you order is not of good quality, then you cannot expect it to last long despite all your efforts and all your care. So make sure that you order your photos on canvas from a reliable company. When you transfer photos to canvas, they should be printed on good quality canvas rolls with good quality ink. Your photos on canvas should be mounted on good quality frames and if they are not mounted on good quality frames, it can warp and damage the surface of the photos on canvas in surface cracks. Once your photos on canvas arrive look for a suitable place for it. Do not choose any spot that will get direct sunlight. When direct sunlight falls on your photos on canvas on daily basis, it will make the canvas fade. So the choice of place is very important. Thirdly, it should not be protected from direct draft as it can make even good quality frames warp. Make sure that the nails that you hammer on the wall does not poke the surface of the canvas from the back as it can damage the canvas leading to tear. Do not try to clean your photos on canvas with wet cloth. Always dust the canvas surface with a dry cloth or a duster. Never leave your photos on canvas accumulate dust for a long time. Regular cleaning is very important to keep your photos on canvas look new. If dust remains on the surface for a long time, it will make your photos on canvas look dull. In case you plan to store your photos on canvas in the cupboard, do not place any heavy weight on it. It is best to wrap it with clean sheet of wrapping paper. Do not use newspaper because the printing ink on the news paper can get settled on the surface of the canvas if it remains wrapped in the news paper for a long time. It is best to store your photos on canvas on a flat surface to ensure that the frames do not get damaged. These are just some of the basic precautions that you should take to make your photos on canvas last long. Never store or display your canvas in a place that is susceptible to moisture.